My Life and Activities here in KSA..: Weekend Clinic Assigment.. It so nice to be assign to Dhahran ITC..every weekends,I have my clinic assignments..eitheir I'll be in Shedgum Clinic or Hawiyah Clinic..I have to travel by car for an hour just to be in clinic on time for my duty..from 6am to 6pm..so tiring yet so enjoying because,I meet new nurses on those clinic and people,during my tour of duty..I am so thankful for this people..they are so kind and accomodating for my 2 days of duty in their respective clinics.Mabuhay kayong Lahat! 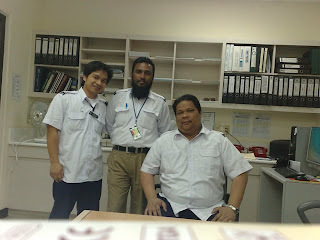 !Shown in the picture was when I make a relieve duty in Hawiyah Clinic with Sky(Nurse) and Sayed..Ambulance Driver.